'In his reply to me and to Deputy Joe Costello, Minister Quinn ignored the arguments we put to him. He regurgitated the tired excuses of his Fianna Fail predecessors in turning down Bethany survivors. In opposition the Labour Party supported including Bethany on the Schedule to the Redress Scheme. In power, what is good enough for Fianna Fail is good enough for Ruairi Quinn. We gave him documents proving that state officials, in particular then Deputy Chief Medical Adviser, Winslow Sterling Berry, ignored evidence of neglect and record numbers of deaths in Bethany Home in the late 1930s. In answer to internal and external criticism of the home's standards of care Sterling Berry said, "It is well recognised that illegitimate children are delicate". Berry then forced the home, in his presence, to cease admitting Roman Catholics, so as to give him and other state officials a quieter life. We discovered 219 unmarked graves of Bethany children in 2010. Over a third died in the five year period (1935-39) before Sterling Berry entered the Bethany Home. That was five years after the state took on statuary powers in 1934 to inspect and to regulate maternity homes like Bethany. 'Ruairi Quinn has refused to address the then state's decision to regulate the sectarianism of the welfare system, but not the actual welfare of neglected and abandoned children. Ruairi Quinn is condoning official sectarianism today in this republic, as a result. 'Ruairi Quinn has rejected not just Bethany survivors but his own party colleagues Joe Costello and Kathleen Lynch who have been campaigning for years on this issue. 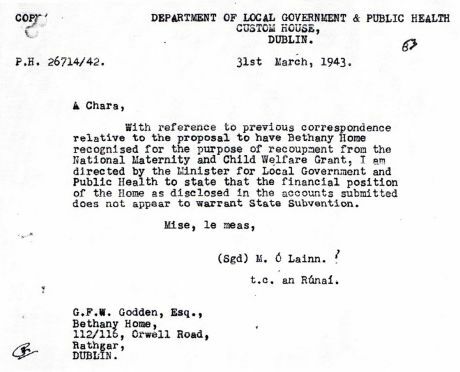 Junior Minister Kathleen Lynch was thrown out of the Dail last October while trying to raise the issue of Bethany survivors with the then Fianna Fail minister. Since 1917, according to Mary Raftery (writing in 2004), ‘Protestant children in need of care’ were ‘essentially dealt with by private institutions’. She suggested that the state’s attitude was one of ‘hands-off’. As a result, she went on, ‘It is difficult to find any State records relating to the Protestant children's homes’. 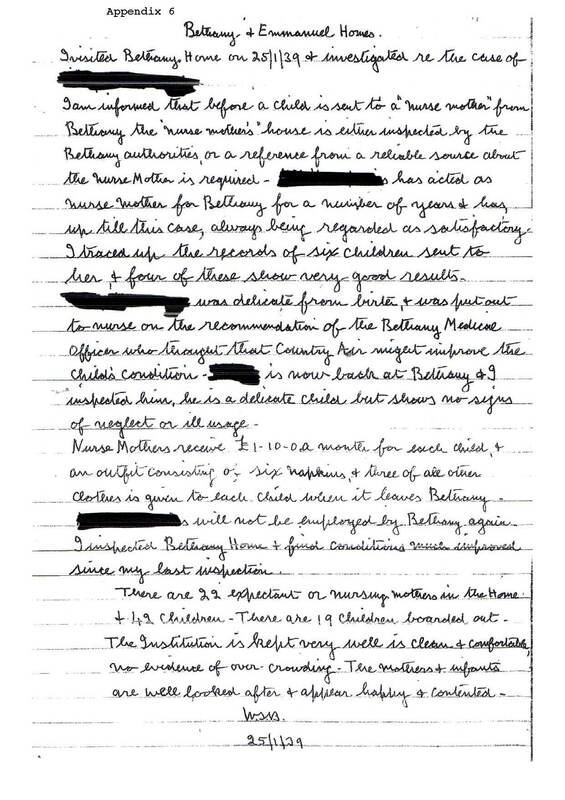 Our research into Bethany Home indicates that it is precisely this policy decision not to interfere which is the reason for neglect and death in the Bethany Home and the reason why the state is culpable. There are in fact state records explaining why the state decided not to interfere when confronted with evidence of severe neglect in the Bethany Home. We supplied these records to you and you have not addressed them. We summarise them here.
. He then went on to assert that Bethany’s problem was that it was a proselytising institution and that he proposed, as Deputy Chief Medical Adviser, to end the practice of attempting to convert Roman Catholics by banning their presence. On his third and final visit he reported being present at the special meeting he initiated, where it was agreed to cease admitting Roman Catholics. Our conclusion, which the evidence shows to be irrefutable, is that in southern Ireland’s sectarian welfare system state officials were concerned to regulate sectarianism but not welfare. Leveling the playing field in this way gave prejudiced officials an easier life. It also fatally compromised the inspection regime in Bethany. 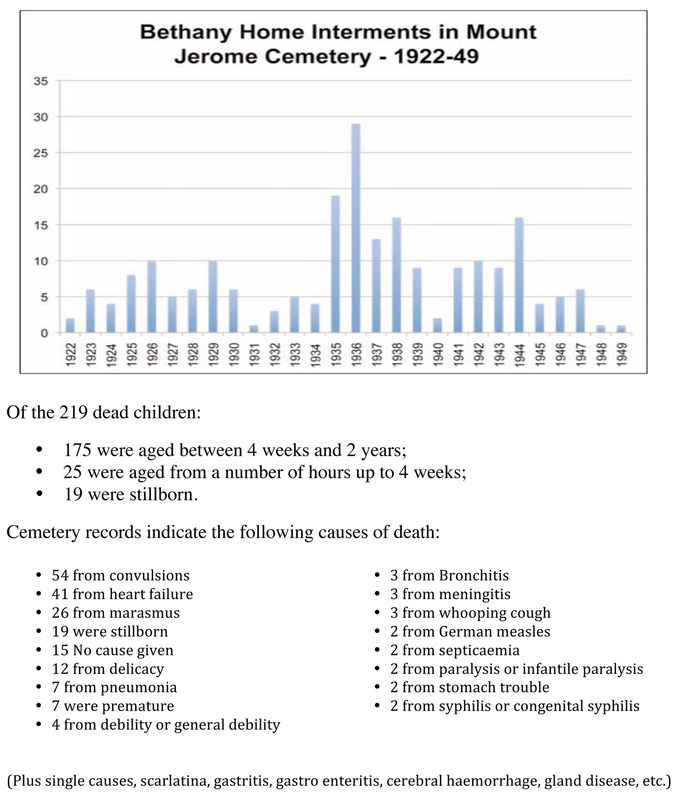 Children continued to die and to become ill in significant numbers. Nearly two thirds of the 219 unmarked graves originated in the 10 year 1935-44 period. 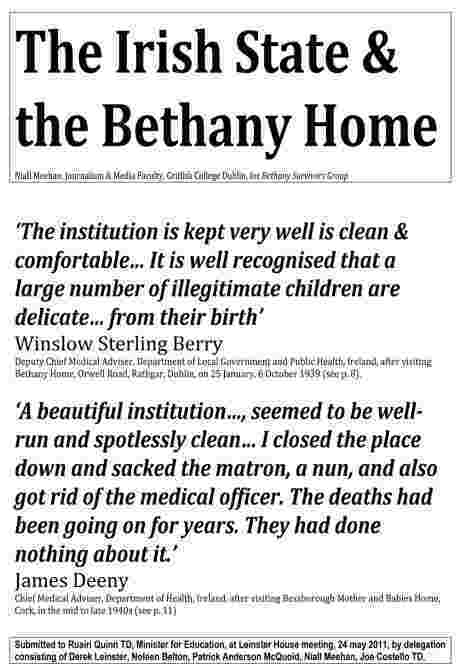 This needless slaughter ended when Bethany was given a Maternity grant in 1949, something originally expected by Bethany’s management in 1940, after the Catholic ban. Had Sterling Berry been less fixated on private denominational matters that were none of his statutory business, and more concerned with his statutory responsibility for public welfare, children’s lives might have been saved. 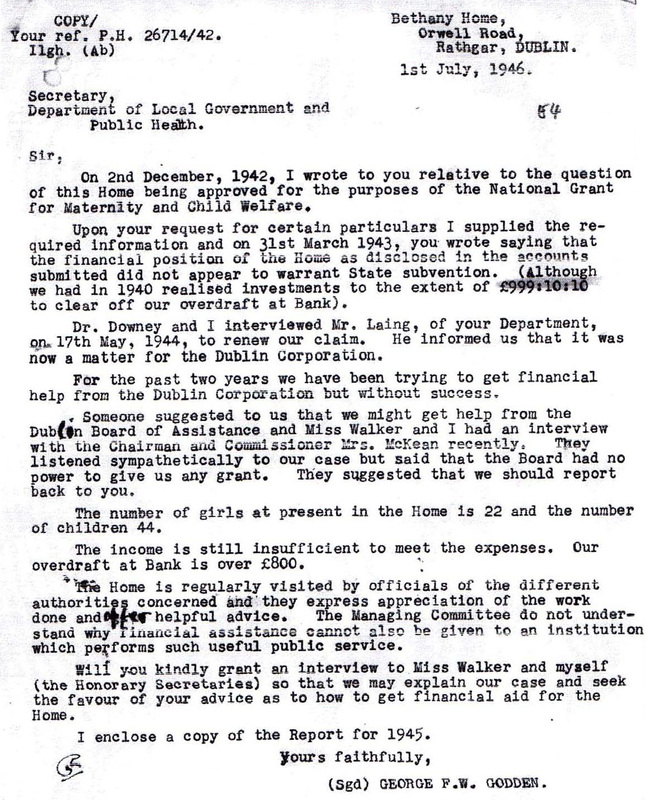 Sterling Berry retired from the Department in 1946, while Deeny authored the 'Mother and Child legislation' that Noel Browne failed to have enacted in 1949-50. Doctors and the Church of Ireland Gazette saw it as ‘communist’ interference in the family. The Roman Catholic Church weighed in, condemned and effectively killed the legislation for similar reasons. Religiously and privately run welfare on the cheap continued. In relation to your point about ‘exclusion of the Bethany Home for religious grounds’, you fail to address the fact that originally in 2002, no Protestant institution was included in the Schedule to the Redress Scheme. Mary Raftery again, who also pointed out that the 2002 Redress scheme originally excluded mother and baby homes like Bethany. However, St Patrick’s, one of the State’s largest, was one of 13 institutions added in 2004. As it was Roman Catholic, she continued, ‘Consequently, the exclusion of similar Protestant institutions does indeed begin to appear worryingly sectarian’. Raftery went on: "A further Church of Ireland institution excluded is the former Smyly's Boys' Home... A number of ex-residents have alleged that they were severely abused there as children... this group feels that it has been sidelined because of its religion". As a result of this and of continuing pressure and complaints from Derek Leinster, Smiley's was then included. Also included was the Protestant run Miss Carr's home, said to have been one of the best run children's homes in the state. One puzzled former resident of Miss Carr’s home we have spoken to threw away his Redress Scheme invitation to apply for compensation. Yet Bethany Home, from which hundreds were sent to unmarked graves, was still not included. To paraphrase James Deeny, it had been going on for years and nothing was done about it. Now, today, you want to do nothing about it. Just as with the Magdalene laundry institutions, the state argues that women referred to Bethany by the courts from 1924 to 1965 (for crimes ranging from petty theft to infanticide), entered there voluntarily. Leaving that spurious argument aside, the point is that the state had a regulatory duty of care that it abandoned. It abandoned it in an institution where it was deemed acceptable to lock up women charged with infanticide and petty crime with unmarried mothers and their abandoned and then neglected offspring. The state’s washing of its hands of its responsibility is a further abandonment. That is not acceptable in this Republic. Please, in the name of decency and of justice, withdraw the letter issued in your name, possibly by a misguided civil servant, and get to the heart of this matter. Bethany survivors deserve redress. We would like you to address the points made here that are central to the case for including Bethany Home in a scheme of redress. These are some more items of evidence that the Minister for Education failed to address. If he thinks the Bethany survivors are going away, he is mistaken. Perhaps he thinks he can deny until we die. If so, his decision of 22 June 21011 may come back to haunt him. None of this material was considered by the minister in his response to me and to Joe Costello TD. Both of these Medical Advisers exceeded their authority - which one saved children's lives? Dr Winslow Sterling Berry, son of the Bishop of Killaloe, was a ‘patronage’ appointment, ‘nominated for his post by Lord Carson and the Protestant Archbishop of Dublin’. On his appointment, Dr Sterling Berry informed later (from 1944) Chief Medical Officer, Dr James Deeny, that ‘when he was appointed, Sir Henry Robinson, the Vice-President of the Local Government Board, our predecessor under English rule, sent for him and said, ‘Dr Sterling Berry, this is a gentleman’s service, keep it that way’. According to Deeny, Sterling Berry ‘liked ‘doing the files’ was very good at it and was meticulous in spotting irregularities and correcting them and always observed the protocol and etiquette in pushing the files around, [so] I left him to it. Sterling Berry was so honest as to be almost naive. He liked to impress his personality on the files by always writing in green ink’. James Deeny, To Cure and to Care, Memoirs of a Chief Medical Officer, Glendale, 1989, pp. 71, 77 - see graphic above that contrasts Deeny's approach to high death rates in maternity homes with Sterling Berry's in Bethany in 1939. Deeny, from Northern Ireland was appointed in 1944, and set about trying to reform the Irish maternity and welfare system. 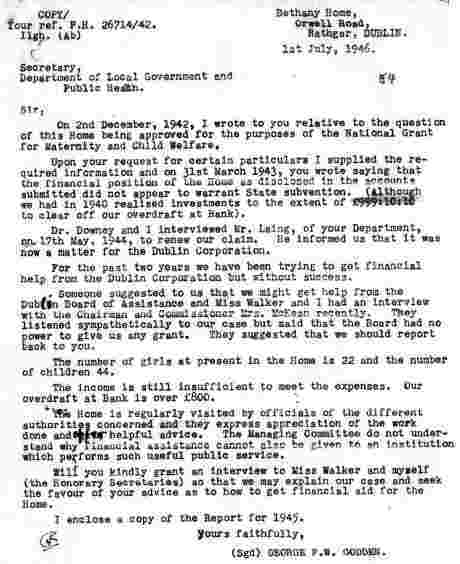 He wrote the 'Mother and Child' scheme legislation that Noel Browne failed have enacted in 1949-50. The legislation provided for free advice for pregnant women. It was killed by conservative doctors (Protestant and Catholic) and by the Roman Catholic Church, who saw it as creeping communism. the home and by Niall Meehan from Griffith College Dublin. omitted from the 2002 Redress Act. Survivors of a Protestant children's home where at least 200 babies and infants died have said they want their case included in an Irish government review. Former resident Derek Leinster has called on TDs to demand that Bethany Home form part of an investigation into the state's involvement in the notorious Magdalene laundries. 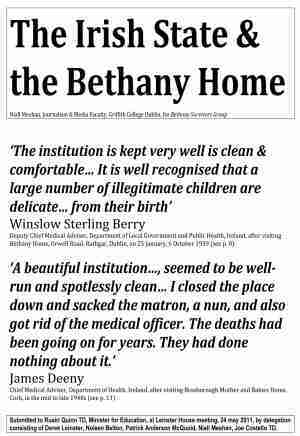 The Bethany Survivors' Group represents people who were infants at the home in Rathgar, Co Dublin, which was run between 1922 and 1972. The group was recently refused access to a state-run compensation fund for a second time. Senator Martin McAleese was appointed to chair a committee that will report on the state's role in alleged abuse at the Magdalene laundries, operated by four Catholic religious orders. Mr Leinster was in Bethany Home from 1941 to 1945. He wrote to TDs and Senator McAleese pleading that he extend his remit to include the Protestant home. "There are similarities with the case put by successive governments in their refusal to add Magdalene laundries and Bethany Home to the schedule to the Redress Act," Mr Leinster wrote. "It is to be hoped that you may be in position to address that historic wrong which is a continuing stain on the reputation of Irish society. I ask you to review this material and ask the ministers responsible to include Bethany Home within your remit. State neglect of Bethany Home residents is also a stain on Irish society." The Bethany group claims to have documents proving that state officials ignored evidence of neglect and record numbers of deaths in the home in the late 1930s. The group also says the state ordered the home not to take in Catholic children. 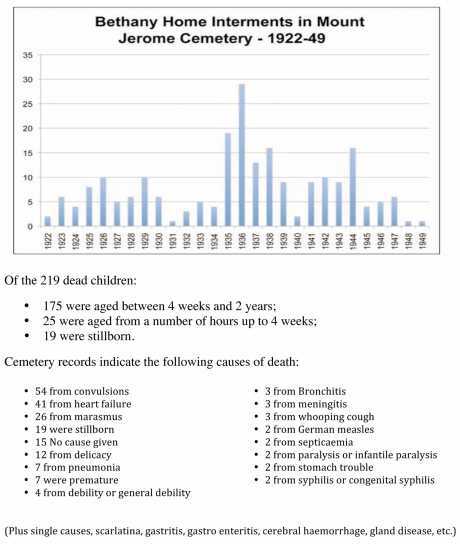 Last year the group, with the help of Griffith College Dublin lecturer Niall Meehan, discovered 219 unmarked graves in Mount Jerome cemetery, Harold's Cross, of children from the home. Records show more than one third of them died in the five years from 1935 to 1939. Sir, – The refusal of Minister for Education Ruairí Quinn to allow Bethany Home residents access to the State’s redress scheme is insupportable (Breaking News, June 22nd). So too is the refusal by the Minister for Justice to allow Senator Martin McAleese to include it in his review of the State’s relationship to the Magdalene laundries. The institutions are comparable in being denied access to the redress scheme. 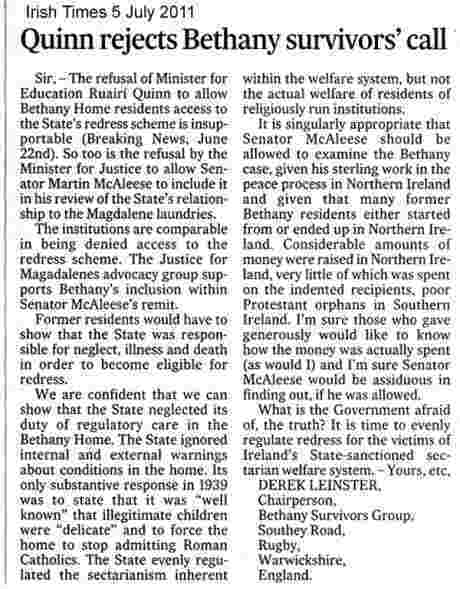 The Justice for Magadalenes advocacy group supports Bethany’s inclusion within Senator McAleese’s remit. Former residents would have to show that the State was responsible for neglect, illness and death in order to become eligible for redress. We are confident that we can show that the State neglected its duty of regulatory care in the Bethany Home. The State ignored internal and external warnings about conditions in the home. Its only substantive response in 1939 was to state that it was “well known” that illegitimate children were “delicate” and to force the home to stop admitting Roman Catholics. The State evenly regulated the sectarianism inherent within the welfare system, but not the actual welfare of residents of religiously run institutions. It is singularly appropriate that Senator McAleese should be allowed to examine the Bethany case, given his sterling work in the peace process in Northern Ireland and given that many former Bethany residents either started from or ended up in Northern Ireland. Considerable amounts of money were raised in Northern Ireland, very little of which was spent on the intended recipients, poor Protestant orphans in Southern Ireland. I’m sure those who gave generously would like to know how the money was actually spent (as would I) and I’m sure Senator McAleese would be assiduous in finding out, if he was allowed. What is the Government afraid of, the truth? It is time to evenly regulate redress for the victims of Ireland’s state-sanctioned sectarian welfare system. Why not let Senator McAleese look at Bethany Home as well? What is the government afraid of, the truth?